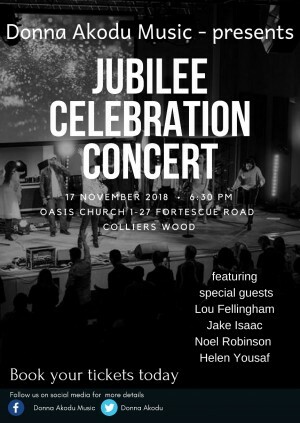 Donna Akodu Music presents her Jubilee Celebration Concert. On Saturday 17th November 2018 join Donna and special friends including Lou Fellingham, Jake Isaac, Noel Robinson and Helen Yousaf, for a time of worship celebrating the songs from her 2 albums When Heaven Breaks in and Butterfly. Doors open at 6pm event starts at 6.30pm. Donna’s music ministry has led her to minister across the United Kingdom, Europe, the USA and other parts of the world for over 20 years. She has been featured on countless Christian television programs and on numerous radio broadcasts in the UK and abroad. She has also worked with numerous worship leaders and was part of Noel Robinson’s group Nu ImageAnd for the nearly 10 years she has been leading worship and facilitating workshops at the Kingdom Worship Movement (KWM) events across the country and is also the worship/vocal coordinator for the events. Donna is has worked with the charity Worldvision at events called Embrace. Leading worship and travelling around the UK alongside Lara Martin, Louise Fellingham, Velveta Thompson, Cath Woolridge and Nicki Sims. She has currently released 2 albums, the first When Heaven Breaks in 2012 and Butterfly in 2014.